You can not disable Delve for a particular site. 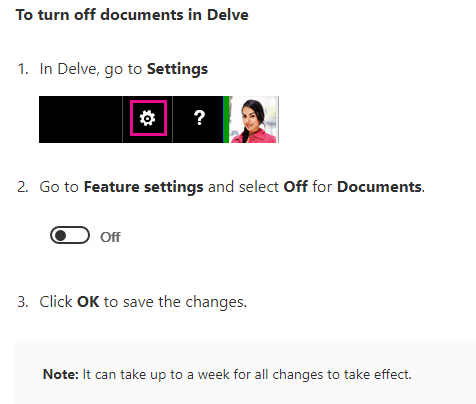 However you can choose to not show documents in Delve. If you choose to not show documents, other people will not see any documents when they go to your profile page in Delve, and you will not see documents on other people's profile pages. You and others will still be able to find each other's documents in Office 365 if you have access to them. The documents just won't show up in Delve. Please note Only you can see your private documents in Delve. Also, other people can't see your private activities, such as what documents you've read, what emails you've sent and received, or what Skype for Business conversations you've been in. Other people can see that you've modified a document, but only if they have access to the same document. Anything findable in Delve is also findable without Delve. You just have to know where to look (or how to search). The correct way to handle that concern is to properly secure the content. Not the answer you're looking for? Browse other questions tagged sharepoint-online office-365 security delve or ask your own question. How to follow a person on Delve (Office 365)?